Lens Description: Samsung\'s 20mm f/2.8 Pancake Lens for NX10 / NX100 is a small (1\" deep with a 2.44\" diameter), lightweight (3.13 oz/89 g) \"pancake\" lens, equivalent to 30.2mm in the 35mm format, designed for the NX10 and NX100 cameras. It has an updated Graphic User Interface (GUI) to support the i-Function lens technology, which allows you to manually select and adjust shutter speed, aperture value, exposure value, ISO sensitivity, and white balance on the lens. It also includes Lens Distortion Compensation (LDC) for reduced image distortion across the NX model range for all camera users. 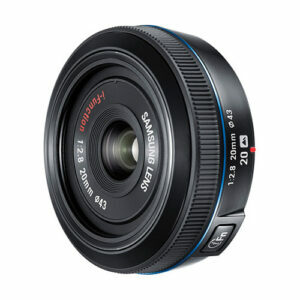 The 20mm f/2.8 lens accepts a 43mm filter.